Zhou Enlai (Simplified Chinese: 周恩来; Traditional Chinese: 周恩來; pinyin: Zhōu Ēnlái; Wade-Giles: Chou En-lai) (March 5, 1898 – January 8, 1976), a prominent Communist Party of China leader, Premier of the People's Republic of China from 1949 until his death in January 1976, and China's foreign minister from 1949 to 1958. Zhou played a leading role in the Chinese Communist Party from its beginnings in 1921, and was instrumental in the Communist Party's rise to power and subsequently in the construction of the Chinese economy and reformation of Chinese society. Zhou was a skilled and able diplomat, advocating for peaceful co-existence. He signed a 30-year Chinese-Soviet treaty of alliance in 1950, and participated in the Geneva Conference in 1954, and the Afro-Asian Bandung Conference in 1955. In 1971 he welcomed Henry A. Kissinger to China, and was largely responsible for arranging and implementing the historic meeting between Mao Zedong and US President Richard Nixon in Peking in February, 1972. 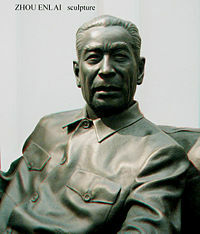 Zhou Enlai survived internecine purges and retained his position in the Chinese Communist Party leadership and the office of Prime Minister until his death in 1976, though he came under attack from the Gang of Four for his moderate stance. He was very popular with the Chinese public, and the public expression of mourning after his death led to riots in Tiananmen Square in April, 1976, and the temporary removal from power of Deng Xiaoping. Zhou Enlai was born March 5, 1898, in Huaian (淮安), Jiangsu Province (江蘇). His family, although of the educated scholar class, was not well off. His grandfather, was a poorly paid minor civil servant, and his father repeatedly failed the Imperial examinations, remaining a lowly minor clerk throughout his life. Zhou Enlai is said to have had an unhappy childhood. He was the eldest son and eldest grandson of the Zhou family. When Zhou was still less than one year old, he was adopted by his father's youngest brother, who was dying of tuberculosis. This adoption took place so that the younger brother would not die childless, a serious scandal to a traditional Confucian family of high status. Lady Chen, his adoptive mother, began to teach him Chinese characters as soon as he could toddle. By the time he was four years old he could read and write several hundred words. In 1907, when he was nine years old, Zhou’s birth mother died of tuberculosis, and in the summer of 1908 Lady Chen also died. Zhou often worked in the fields to earn food for his family. Since Zhou was now an orphan, it was arranged that he leave Huai'an in 1910 and go to the city of Shenyang in Manchuria to live with his uncle, Yikang. There, he was enrolled in the Tung Guan model school that taught “new learning:” mathematics and natural science, as well as Chinese history, geography and literature. The students were also exposed to translations of western books, where Zhou read about freedom, democracy and the American and French revolutions. In 1913, at the age of 15, Zhou graduated from Tung Guan, and in September of that year he was enrolled in the Nankai (南开) school, located in Tianjin (天津; Tiānjīn; Tientsin). For the next four years he was a diligent student at the prestigious American-funded missionary school. Throughout the period of his education, China was in turmoil. In 1911 the Xinhai Revolution (Hsinhai Revolution; 辛亥革命; Xīnhài Gémìng) of Sun Yat-sen (孫文 / 孫中山 / 孫逸仙) overthrew the Qing dynasty and established the Republic of China (中華民國). The outbreak of the Great War in Europe relieved the pressure from European imperialists, but presented an opportunity for Japan to push its own dominance. Zhou could see that China was being ruined by foreign intervention, and shared in the wrath, the protest, and the indignation at the plight of China. In 1917, Zhou went to Tokyo, Japan, for further studies. His goal was to become a teacher so that he could have influence on the youth of China, but he found he could not concentrate. He could not study and had difficulty with the Japanese language. In Nankai he had written and spoken against the military and political pressure which Japan was exerting upon China, and its inexorable slide into anarchy. He challenged his fellow students to think what his generation could do to save China. Their answer was to study, and to become educated in the sciences and professions. China needed elite, knowledgeable doctors, engineers, and teachers. “But why?” he asked. “If China is to disappear, what is the use of studying?” Zhou decided to leave Japan, partly influenced by a fellow student from Nankai, Tung Kwang Hsien (童冠贤, 童冠賢). In early May, 1919, dejected and without completing his education, he left Japan, and arrived in Tianjin on May 9, in time to take part in the momentous May Fourth Movement protesting the Treaty of Versailles and the granting of Shandong to the Japanese. Zhou first came to national prominence as an activist during the May Fourth Movement. He had enrolled as a student in the literature department of Nankai University (南開大學), which enabled him to visit the campus, but he never attended classes. He became one of the organizers of the Tianjin Students Union, whose avowed aim was “to struggle against the warlords and against imperialism, and to save China from extinction." Zhou became the editor of the student union’s newspaper, Tianjin Student. In September, he founded the Awareness Society with twelve men and eight women. Fifteen-year-old Deng Yingchao (鄧穎超), Zhou’s future wife, was one of the founding female members. (They were not married until much later, on August 8, 1925). Zhou was instrumental in the merger between the all male Tianjin Students Union and the all female Women’s Patriotic Association. In January 1920, the police raided the printing press and arrested several members of the Awareness Society. Zhou led a group of students to protest the arrests, and was himself arrested along with 28 others. After the trial in July, they were found guilty of a minor offense and released. An attempt was made by the Comintern, (Communist International, also known as the Third International) to induct Zhou into the Communist Party of China, but although he was studying Marxism he remained uncommitted. Instead of being selected to go to Moscow for training, he was chosen to go to France as a student organizer. Deng Yingchao was left in charge of the Awareness Society in his absence. On November 7, 1920, Zhou Enlai and 196 other Chinese students sailed from Shanghai for Marseilles, France. At Marseilles they were met by a member of the Sino-French Education Committee and boarded a train to Paris. Almost as soon as he arrived, Zhou became embroiled in a wrangle between the students and the education authorities running the “work and study” program. The students were supposed to work in factories part time and attend class part time. Because of corruption and graft in the Education Committee, however, the students were not paid. As a result they simply provided cheap labor for the French factory owners and received very little education in return. Zhou wrote to newspapers in China denouncing the committee and the corrupt government officials. Zhou traveled to Britain in January; he applied for and was accepted as a student at Edinburgh University. The university term didn’t start until October, so he returned to France, moving in with Liu Tsingyang and Zhang Shenfu, who were setting up a Communist cell. Zhou joined the group and was entrusted with political and organizational work. There is some controversy over the date when Zhou joined the Communist Party of China. To maintain secrecy, members did not carry membership cards. Zhou himself wrote "autumn, 1922" at a verification carried out at the Party's Seventh Congress in 1945. There were 2,000 Chinese students in France, some 200 each in Belgium and England and between 300 and 400 in Germany. For the next four years Zhou was the chief recruiter, organizer and coordinator of activities of the Socialist Youth League. He traveled constantly between Belgium, Germany and France, safely conveying party members through Berlin to board trains for Moscow, where they were to be taught the skills of revolution. At first the CCP, established in July 1921 by Chen Duxiu( 陳獨秀), rejected the suggestion of the Comintern that they establish a “united front” with Sun Yat-sen’s new Kuomintang (中國國民黨, KMT or Nationalist Party), but in 1923 the CCP changed its policy. Zhou was now charged with the task of coordinating cooperation between the two vastly different political movements in Europe. He apparently did such a good job that he was ordered back to China to take charge of the work of the united front in the Kuomintang stronghold in Guangzhou (廣州). He arrived in Hong Kong in July 1924. 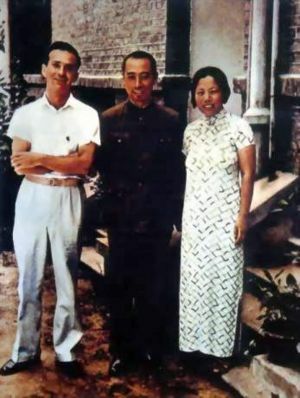 Zhou Enlai (middle) and his wife Deng Yingchao with American journalist Edgar Snow, approx. 1938. In January, 1924, Sun Yat-sen had officially proclaimed an alliance between the Kuomintang and the Communists, and a plan for a military expedition to unify China and destroy the warlords. The Whampoa Military Academy was set up in March to train officers for the armies that would march against the warlords. Classes began on May 1, and the speech given by Dr. Sun Yat Sen at the official opening ceremony later became the lyrics of the national anthem of the Republic of China. Russian ships unloaded crates of weapons at the Guangzhou (廣州) docks. Comintern advisers from Moscow joined Sun’s entourage. In October, shortly after he arrived back from Europe, Zhou Enlai was appointed deputy-director of the political department at the Whampoa Military Academy, where Chiang Kai-shek (蔣介石 / 蔣中正) was the commandant, in Guangzhou (廣州). Zhou soon realized that the Kuomintang was riddled with intrigue. The powerful right wing of the Kuomintang was bitterly opposed to the Communist alliance. Zhou was convinced that the Chinese Communist Party, in order to survive, must have an army of its own. "The Kuomintang is a coalition of treacherous warlords," he told his friend Nie Rongzhen (聶榮臻), recently arrived from Moscow and named a vice director of the academy. Together they set about to organize a nucleus of officer cadets who were CCP members and who would follow the principles of Marx. For a while they met no hindrance, not even from Chiang Kai-shek (蔣介石 / 蔣中正), the director of the academy. Sun Yat-sen (孫文 / 孫中山 / 孫逸仙) died on March 12, 1925. No sooner was Sun dead than trouble broke out in Guangzhou. A warlord named Chen Chiungming made a bid to take the city and province. The East Expedition, led by Zhou, was organized as a military offensive against Chen. Using the disciplined core of CCP cadets, the expedition met with resounding success. Zhou was promoted to head Whampoa’s martial law bureau and quickly crushed an attempted coup by another warlord within the city. Chen Chiungming again took the field in October, 1925, and was defeated by Zhou, who this time captured the important city of Shantou (汕頭) on the South China coast. Zhou was appointed special commissioner of Shantou and surrounding region. Zhou began to build up a party branch in Shantou whose membership he kept secret. On August 8, 1925, Zhou and Deng Yingchao were finally married after a long-distance courtship of nearly five years. 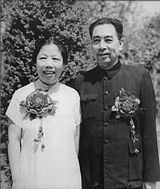 The couple remained childless, but adopted several orphaned children of "revolutionary martyrs;" one of the more famous was future Premier Li Peng (李鵬). After Sun’s death, the Kuomintang was run by a triumvirate composed of Chiang Kai-shek, Liao Zhungkai and Wang Jingwei (汪精衛), but in August, 1925 the left wing member, Liao Zhungkai, was murdered. Chiang Kai-shek used this murder as a pretext to declare martial law and consolidate right wing control of the Nationalists. On March 18, 1926, while Mikhail Borodin, the Russian Comintern advisor to the United Front, was in Shanghai, Chiang created a further incident to usurp power from the communists. The commander and crew of a Kuomintang gunboat was arrested at the Whampoa docks, in the Zhongshan Warship Incident. This was followed by raids on the First Army Headquarters and Whampoa Military Academy. Altogether 65 communists were arrested, including Nie Rongzhen. A state of emergency was declared and curfews were imposed. Zhou had just returned from Shantou and was also detained for 48 hours. On his release he confronted Chiang and accused him of undermining the United Front, but Chiang argued that he was only breaking up a plot by the communists. When Borodin returned from Shanghai he believed Chiang’s version and rebuked Zhou. At Chiang's request, Borodin turned over a list of all the members of the CCP who were also members of the Kuomintang. The only omissions from this list were the members Zhou had secretly recruited. Chiang dismissed all the rest of the CCP officers from the First Army. Wang Jingwei, considered too sympathetic to the communists, was persuaded to leave on a “study tour” in Europe. Zhou Enlai was relieved of all his duties associated with the First United front, effectively giving complete control of the United Front to Chiang Kai-shek. In 1926, the Kuomintang (KMT) and the Communist Party of China (CPC) began the Northern Expedition (北伐; běi fá), a military campaign intended to speed up the Chinese revolution against feudalism and imperialism, end the rule of local warlords, and unify China under the Nationalists. Zhou worked as a labor agitator. In 1926, he organized a general strike in Shanghai, opening the city to the Kuomintang. The Long March ended in October 1935 at Yan’an (延安; Yán'ān; Yen-an) in northern Shensi province, with the securing of the Communists' base there. Zhou was made the CCP's chief negotiator and was given the difficult job of forming a tactical alliance with the Nationalists. In late 1935, building on Moscow's new so-called “popular-front” strategy against fascism, the CCP proposed to unite with the Nationalists and all patriotic Chinese in order to resist Japanese aggression. In December of 1936, in the Xi'an Incident, Chiang Kai-shek was arrested in Xi’an (in Shensi) by his own generals, who wanted to end the CCP-Nationalist civil war. Zhou immediately flew to Xi’an, helped to secure Chiang Kai-shek's release, and negotiated the Second CCP-KMT United Front. Coining the famous phrase "Chinese should not fight Chinese but a common enemy: the invader." Zhou spent the Sino-Japanese War (1937-1945) as CCP ambassador to Chiang's wartime government in Chongqing (重慶) and took part in the failed negotiations following World War II. Zhou also participated in the unsuccessful peace negotiations with the Nationalists in 1946, sponsored by the United States and held under General George C. Marshall. In 1949, with the establishment of the People's Republic of China (中華人民共和國; Zhōnghuá Rénmín Gònghéguó), Zhou assumed the role of Prime Minister and Minister of Foreign Affairs. On February 14, 1950, Zhou signed a 30-year Chinese-Soviet treaty of alliance in Moscow. In June 1953, he made the five declarations for peace. He headed the Communist Chinese delegation to the Geneva Conference in 1954 and to the Afro-Asian Bandung Conference in1955. On his way to the Bandung Conference he survived an assassination attempt by the nationalist Kuomintang. An American-made MK7 was planted on a charter plane, Kashmir Princess, scheduled for Zhou's trip; Zhou changed planes at the last minute, but the rest of his crew of 16 people died. Between 1956 and 1964 Zhou traveled widely throughout Europe, Asia, and Africa. In 1958, the post of Minister of Foreign Affairs was passed to Chen Yi (陳毅), but Zhou remained Prime Minister until his death in 1976. In 1964, Zhou visited Moscow but was unable to resolve the fundamental differences that had arisen between China and the Soviet Union. Zhou was largely responsible for the re-establishment of contacts with the West in the early 1970s. In July 1971, when the American envoy Henry A. Kissinger made a dramatic visit to him in Beijing, Zhou gained a reputation as a diplomat and negotiator in the American press. He was largely responsible for arranging and implementing the historic meeting between Mao Zedong and U.S. President Richard Nixon in Beijing in February, 1972, and signed the Shanghai Communiqué (上海公報). 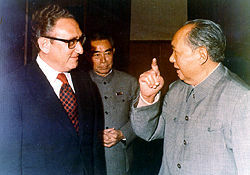 Zhou, shown here with Henry Kissinger and Mao Zedong. Zhou's first major domestic focus after becoming premier was China's economy, in a poor state after decades of war. He aimed at increased agricultural production through the even re-distribution of land, and at developing industry. He also initiated the first environmental reforms in China. In 1956, Zhou was elected one of the Chinese Communist Party’s four vice-chairmen, and after the Cultural Revolution of the late 1960s, when there was only one vice-chairman, Zhou remained as the third-ranking member of the Standing Committee of the Politburo, despite his relatively moderate position on many issues. In 1958, Mao Zedong( 毛澤東) began the Great Leap Forward (大躍進; Dàyuèjìn), aimed at increasing China's production levels in industry and agriculture with unrealistic targets. As a popular and practical administrator, Zhou, though critical of Mao’s policies, maintained his position through the Leap. The Cultural Revolution (無產階級文化大革命; Wúchǎn Jiējí Wénhuà Dà Gémìng 1966-1976) was a great blow to Zhou. At its late stages in 1975, he pushed for the "four modernizations" (四個現代化; sì gè xiàn dài huà) to undo the damage caused by the campaigns. During the late stages of the Cultural Revolution, in 1975, Zhou became the target of Chairman Mao's and Gang of Four's (四人幫; Sì rén bāng), a group of political radicals including Mao's fourth wife, Jiang Qing, Wang Hongwen, Zhang Chunqiao, and Yao Wen-yuan, who were later tried and convicted for implementing Mao’s harsh policies. They were largely responsible for the Cultural Revolution, and aimed to overthrow moderate government officials through slander and criticism. Zhou became to the target of their political campaigns, which accused him of "criticizing Song Jiang (宋江), evaluating the Water Margin (水滸傳; Shuǐhǔ Zhuàn)," alluding to a Chinese literary work, with Zhou as an example of a political loser. He was also targeted by the Criticize Lin (Biao) campaign and its extension, the Criticize Lin, Criticize Confucius (批林批孔运动; pī Lín pī Kǒng yùndòng) campaign, a political campaign started by Mao’s wife Jiang Qing, because he was viewed as one of the Gang of Four's primary political opponents. During the demise of the Cultural Revolution in the 1970s, Zhou sought to restore Deng Xiaoping and other moderate leaders to positions of power. After discovering he had cancer, Zhou began to pass many of his responsibilities onto Deng Xiaoping (鄧小平; Dèng Xiǎopíng; Teng Hsiao-p'ing). Zhou was hospitalized in 1974 for bladder cancer, but continued to conduct work from the hospital, with Deng Xiaoping as the First Deputy Premier handling most of the important State Council matters. Zhou died on the morning of January 8, 1976, eight months before Mao Zedong. Zhou's death brought messages of condolence from many non-aligned states that had been affected by his actions during his tenure as a diplomat and negotiator. Zhou's body was cremated and the ashes scattered by air over hills and valleys, according to his wishes. Inside China, the infamous Gang of Four (led by Jiang Qing) regarded Zhou's death as the convenient removal of the last major challenge to their plot to seize absolute power. At Zhou's funeral, Deng Xiaoping delivered the official eulogy, but he was later forced out of politics until after Mao's death. The Gang feared that the spontaneous expressions of mourning which had arisen among the people might be dangerous to them. During the Tiananmen Incident (四五天安门事件) in April, 1976, an attempt by the Gang of Four to suppress mourning for the "Beloved Premier" resulted in rioting. Poetry criticizing the Gang of Four was found on some of the wreaths that were laid, and all wreaths were subsequently taken down at the Monument to the People's Heroes. These actions only further aroused the people. Thousands of armed worker-soldiers brutally crushed the people’s protest in Tiananmen Square, and hundreds of people were arrested. The Gang of Four blamed Deng Xiaoping for the uprising and removed him from all his official positions. A memorial hall has been dedicated to Zhou and his wife in Tianjin, named Tianjin Zhou Enlai Deng Yingchao Memorial Hall (天津周恩來鄧穎超紀念館), and a statue was erected in Nanjing city, where in the 1940s he worked with the Kuomintang. In 1977, an issue of national postage stamps commemorated the first-year anniversary of his death, and another in 1998 commemorated his 100th birthday. Zhou Enlai is generally regarded as a skilled negotiator, a master of policy implementation, a devoted revolutionary, and a pragmatic statesman with patience and an unusual attentiveness to detail and nuance. He was also known for his dedication, and is sometimes said to be the last Mandarin bureaucrat in the Confucian tradition. Zhou's political behavior should be viewed in light of his political philosophy as well as his personality. To a large extent, Zhou epitomized the paradox inherent in a communist politician with traditional Chinese upbringing: at once conservative and radical, pragmatic and ideological, possessed by a belief in order and harmony as well as a commitment to rebellion and revolution. Though a firm believer in the Communist ideal on which modern China was founded, Zhou is seen by many to have had a moderating influence on some of the worst excesses of Mao's regime, although he did not wield the power necessary to bring about major changes to policy. It has been suggested that he used his influence to protect some of China's oldest religious and royalist sites from the rampages of Mao's Red Guards, and to shield many top-level military and government leaders during Mao’s purges. All links retrieved July 3, 2013. Zhou Enlai Biography From Spartacus Educational. This page was last modified on 3 July 2013, at 14:15.